Remember when Singapore’s taps ran dry for 10 months? Imagine waking up to find no water running from your taps. Four days a week, water access to your home is cut for six hours. Showering is out of the question. You can only wipe yourself with a wet towel occasionally and spend the rest of the day bathed in your perspiration. You try to bear with the heat but it’s no use. Your sweaty shirt clings to your body as you go about your day. When the supply comes back on, there is a frantic rush to fill every available container in the house with water. This scene isn’t far from reality – the last water rationing in Singapore occurred just 53 years ago in 1963. Back then, a severe drought swept through Singapore and our neighbour up north, forcing the authorities to issue an ‘urgent appeal’ to the public to use less water until the water levels went back to normal. 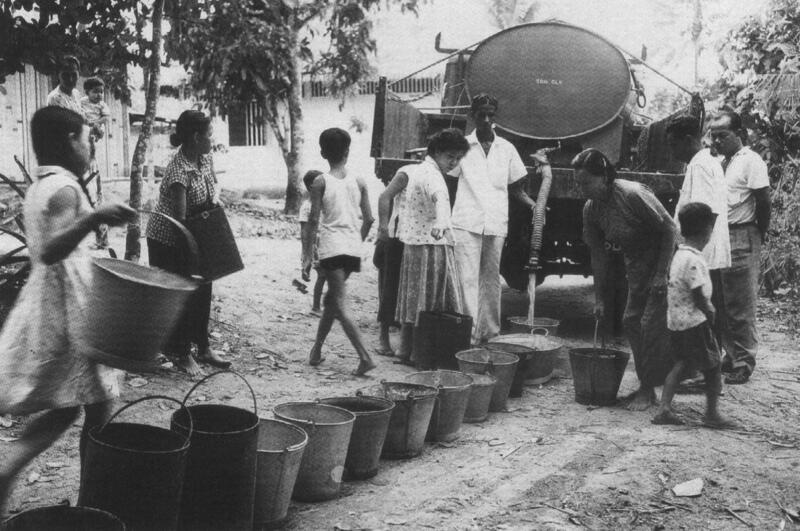 Water Crisis headlines in Singapore in 1963. Taken from NewspaperSG. Unfortunately, the public did not heed the appeal, leading to water rationing that lasted 10 months, from April 1963 to February 1964. – Leong Sai Mooi, resident who recounted his experience with water rationing in an Asiaone report dated 6 March 2014. Water rationing in 1960s. Source PUB. Thankfully things are different now. Today, we have such easy access to water that according to the Public Utilities Board, the average Singaporean uses about 151 litres of water daily. That’s more than 100 1.5-litre Coke bottles every day. Careful you don’t drown in all that water. Living with an unreliable supply of clean water may be history for us, but this is the reality for more than 200 million poor people in rural Asia today. In Singapore, we have convenient access to affordable clean water 24/7 from the tap. Singaporeans only pay $0.14 for 50 litres of clean water. For someone in rural Asia, the cost of water can be up to much higher due to reasons like poor infrastructure and lack of technology. Coupled with their low wages, clean water can be up to 1,260 times less affordable than in Singapore. When there is no clean water available, even the simple act of bathing exposes them to health risks. Our water troubles might be forgotten and shelved away in old newspaper archives, but many of our neighbours in Asia are still living in that reality with no access to clean water. If you would like to help, you can partner with Lien AID, a home-grown non-profit organisation that partners local governments, civil society organisations and private businesses to provide clean water to people who don’t have it. Their programmes enable the rural poor to access clean water, sanitation, and ultimately, a better life. Top photo from Water Conservation in Singapore. This sponsored post helps pay for our water bills so that we won’t need to ration water.